Sea Turtles are living in the oceans for more than 110 million years. Though the sea turtles have survived mass extinctions due to natural disasters, threat to sea turtles from fishing industry is increasing. Trawl fishing gear are becoming death traps to sea turtles. Efforts to reduce threat to sea turtles started from 1970s by designing and testing Turtle Excluder Device (TED). It is disturbing to note that all the fishing trawlers are not using either TEDs or properly functioning TEDs to protect sea turtles. Trawling is a type of fishing using large fishing nets towed by one or more boats. The basic trawl is a funnel shaped net with wide mouth kept open and is towed on the water surface or in the seabed. Sea turtles easily get trapped in these trawl nets when trawling is done closer to coast. There are many types of trawls such as: Otter trawls, Beam trawls, Fly net trawls including skimmer, roller frame, pair and clam kicking trawls. The most affected sea turtles in Atlantic Ocean and Gulf of Mexico trawling are: Loggerhead, Kemp’s Ridley, Leatherback and Green. The trawls are modified to accommodate ‘Turtle Excluder Device’ to provide escape route to sea turtles even if they get trapped in the trawls. A TED is a grid of bars with an opening either at the top or the bottom of the trawl net. The grid is fitted into the neck of a shrimp trawl. Small marine species such as shrimp pass through the bars and are caught in the bag end of the trawl. 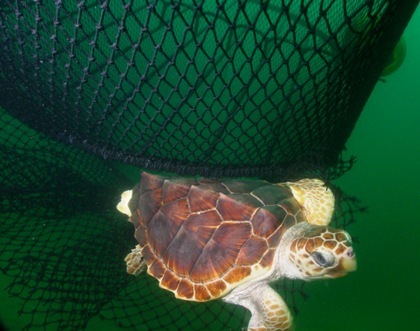 When larger marine species, such as marine turtles and sharks are captured in the trawl they strike the grid bars and are ejected through the opening. Suitable modifications to TED openings have been carried out to initial TED designs that did not allow release of larger leatherback and hardshell turtles.Interestingly 97 percent success is seen in trawls using properly functioning TEDs. Here is a photograph from NOAA, showing how a Loggerhead sea turtle escapes from trawl net through a Turtle Excluder Device. Here is an interesting video clip to show how a sea turtle escapes from trawl net through a Turtle Excluder Device. You can tell the government to protect sea turtles from trawls at Oceana. Read more about Turtle Excluder Device from NOAA Fisheries and Oceana.